The most popular Ayyappa Swamy Temple of Hindu God Ayyappa is situated at Sabarimala in Kerala but his devotees found all over in India. So Ayyappa Swamy temple found in many states of India. There are also lots of temples in foreign countries of Lord Ayyappa such as Ayyappa temple in the USA, Ayyappa temple Chicago etc. 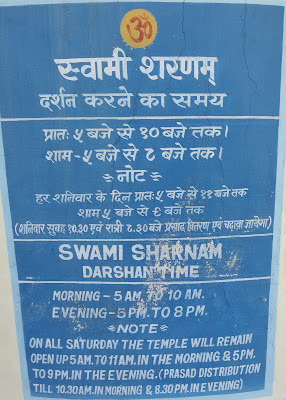 There is an Ayyappa Shaneshwar Mandir in Bishrampur. Bishrampur is a small town of district Surajpur, Chhattisgarh. The Ayyappa Shaneshwar temple is very popular among the nearby cities of Bishrampur. Ayyappa Temple is situated in a very peaceful place in Bishrampur and having lots of space for all type of worship activities. Ayyappa is the son of Lord Shiva and Mohini. Mohini is the female avatar of God Vishnu. Lord Vishnu takes Mohini Avatar for killing the Bhasmasura. Bhasmasura had the power to kill anyone by touching on anyone's head. Lord Shiva gave this power to Bhasmasur but for testing, this power Bhasmasur want to touch the Lord Shiva head so Lord Vishnu take Mohini avatar. Bhasmasur falls in love with Mohini and touch his own head and killed himself. Lord Shiva also gets attracted to Mohini. Hence Lord Ayyappa was born by the union between Lord Shiva and Mohini (Lord Vishnu). Hence Lord Ayyappa was born by the union between Lord Shiva and Mohini (Lord Vishnu). So Lord Ayyappa also called as Hariharan Puthiran means son of Lord Shiva and Vishnu. Word 'Hari' is used for Lord Vishnu and 'Haran' is used for Lord Shiva. As per Tamil calendar, Panguni Uthiram is considered as the Ayyappa Swamy birthday date. Panguni Uthiram is a very important festival in Tamil Nadu. Ayyappan Jayanti is celebrated each and every year in Tamil Nadu. Panguni is the last month of Tamil calendar. As per the English calendar, it will come in March or April month. The Ayyappa Shaneshwar temple was established on the 15th January in the year 1984 with the huge support of the local people of the area. 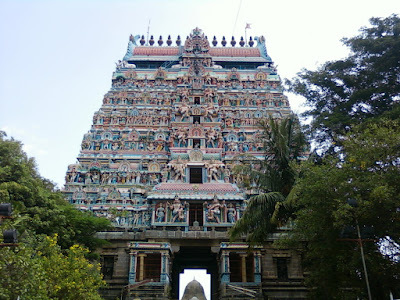 The temple is built as same as like Ayyappa Swamy Temple situated at Sabarimala in Kerala. For the establishing the statue of Lord Ayyappa a priest called Brahmashree Mahesvaran Adiraman Bhattarai from Kerala. Statue of the Lord Ayyappa made from Ashtadhatu by the famous statue maker in Kerala. Prayer of Lord Ayyappa in the Ayyappa Shanihwer temple done in same way as following in the Ayyappa Swamy Temple at Sabarimala in Kerala. There is a good link between the Lord Ayyappa and Lord Shani. A devotee of Ayyappa who takes Ayyappa Deeksha of 41 days with a prescribed way he will be free from the Shani Dasha of seven years. In this temple, there is other Gods statue also established such as lord Shani, Lord Ganesha. 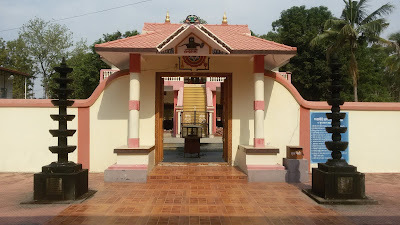 This temple is popularly known as Ayyapa Swamy Mandir or Shani Mandir among the local people. There are lots of ways to Lord Ayyappa worship for their devotees. The list is very long. I just give you list of some popular methods of them and other worship activities inside the temple. There are no shops outside the Ayyappa temple for purchasing Prasad and other items for the worship of Lord Ayyappa. All management of the Ayyappa temple is under the Shree Ayyappa Seva Samiti. So there is a counter inside the temple which provides all worship items, fruits and sweets etc for offering to Lord Ayyappa. 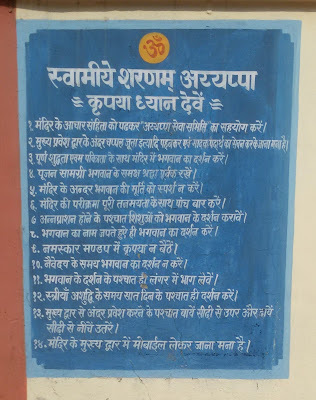 There is a board of long list of all types puja which can be done inside the temple. The price of all type of worship is also mention in the list. You will get a bill for anything purchased from the counter or for any type worship you done inside the temple. The members of the Shree Ayyappa Seva Samiti belongs to South India. The priest of the temple also a south Indian. Lord Ayyappa is linked with the most famous festival Makara Sankranti so there is annual function and feast for all devotee is organised by the local people and South Eastern Coalfields Limited (A Government Company) on this day. Every year lots of people come on this day to pray to Lord Ayyappa from nearby cites. All devotees have to follow the Ayyappa temple Aachar Sanhita. Slippers, Sandals and shoes are not allowed inside the temple so please remove them before entering the temple. Please enter the temple with full faith, holiness and devotedness. With full faith, keep your puja items in front of Lord Ayyappa statue. Don't touch the statue of Lord Ayyappa inside the Ayyappa Temple. After entering in temple use left side stairs for going up. Then use left side stairs for going down. Women can come in the temple after seven days of their monthly periods. Devotees can take Prasad only after the visiting Lord Ayyappa. Circumambulate the Ayyappa temple five times. Mobiles is strictly prohibited inside the main temple. There is no entry ticket for the Lord Ayyappa's devotees in the Ayyapa Temple Bishrampur. 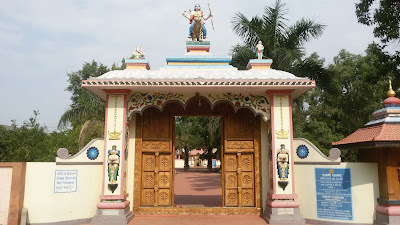 There is two entry gates for entering in the temple. Inside the temple the main gate of the temple which is in front of Lord Ayyappa. The main gate is only open in 15th November in the year during the very famous festival. 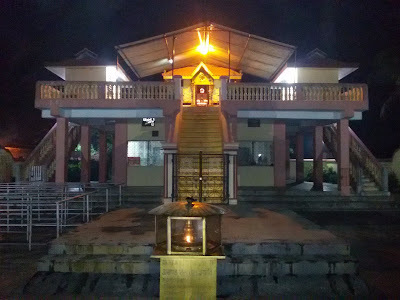 Lord Ayyappa Temple is situated near to Bishrampur Bus stand and is at walkable distance. Ayyappa Temple will be approximately less than 1 km far from the bus stand of Bishrampur. The Ayyappa Temple from the Bishrampur Railway station far away approximately 3 km. The address of the Ayyappa Temple is written below. 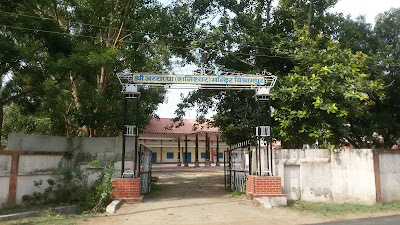 Bishrampur town was first under the Surguja district but now it under the Surajpur district. Bishrampur is a small town but it is well connected by the private transport bus services from various cities such as Varanasi, Renukut, Raipur, Ambikapur, Patna etc. It is also well connected by railway. You can get trains from Anupur or Katni for Bishrampur. You can reach from train also, Bishrampur railway station only 1 km from the main market. From the railway station, you have to take a private vehicle because there is no public transport available. Ayyappa Temple is near to Bus stand. You have to book private taxi or auto for going there. If you have own vehicle it is best.